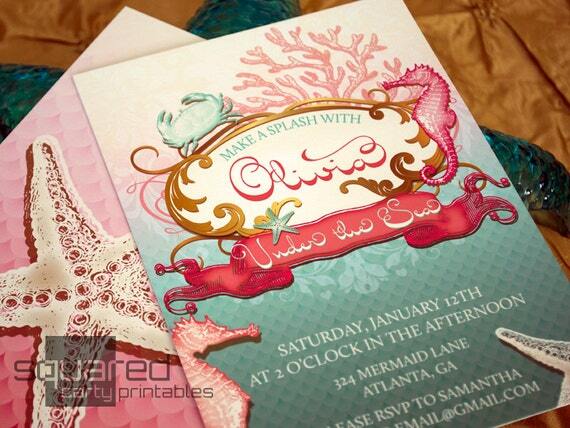 This Mermaid Printable Birthday Party Invitation has lots of gorgeous detailing in the design. Absolutely stunning when printed on shimmer paper. Available as a DIY printable invitation or you can order your prints directly from us, shipped straight to your home. Any delay in providing personalization information may delay your order. This listing includes a printable PDF file only. NO PRINTED MATERIALS WILL BE SHIPPED. All PDF files are sized as 8.5" x 11" US letter-sized pages unless otherwise noted in the listing. DELIVERY OF YOUR FILE - File will be sent to email address on Etsy account within 3 BUSINESS DAYS (Monday – Friday) unless otherwise stated and you will be able to proof and request edits. ALL PDF FILES ARE LOCKED FOR EDITING EXCEPT FOR FILL-IN LABELS. YOU WILL NEED THE Adobe® Reader® TO PROPERLY OPEN AND PRINT THE FILE. NO PASSWORDS WILL BE GIVEN OUT UNDER ANY CIRCUMSTANCES. PLEASE NOTE: This file is for PERSONAL USE ONLY. You may not forward, share, sell or distribute the file or the finished product(s) produced. It is for non-commercial use only. All rights reserved by Squared Party Printables. Welcome to Squared Party Printables and thank you for visiting our Etsy shop. We look forward to helping you plan your event. Keep up to date with our sneak peeks, promotions, and behind the scenes shots.